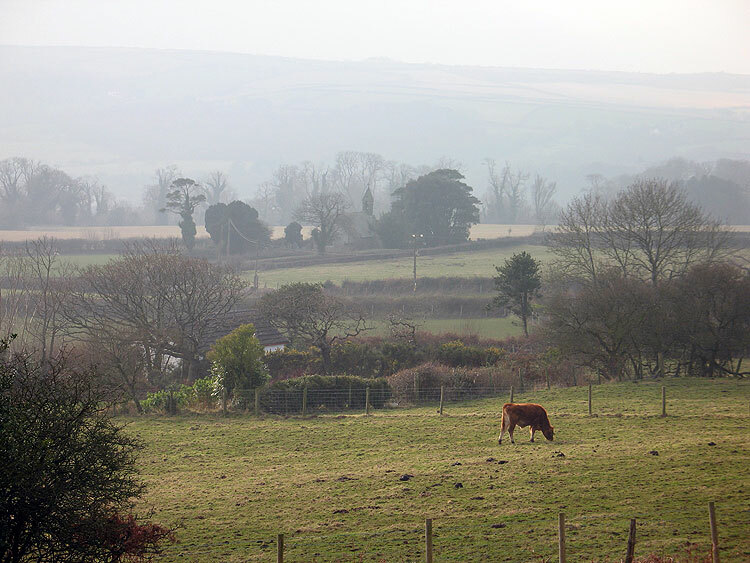 The historic landscape area of Nicholaston is an area of settlement and associated fieldscape approximately encompassing the area of the former parish of Nicholaston, excluding the woodland to the south and common land to the north (Cefn Bryn) and south (Nicholaston Burrows). Nicholaston is mentioned as an ancient Knight's fee in a charter of 1306, though little else is known (Nicholl 1936,168-169). It appears to have been the early nucleus of the holdings of the Mansel family, who later gained the Penrice and Oxwich Estates, through marriage (Nicholl 1936,186). The church of St Nicholas at Nicholaston (00293w; 158; LB 23538 II*) does not appear in documentary records until 1558 (Clarke 1901, 2038). It is set by itself in a small quadrangular churchyard (05244w), and has never apparently been in a nucleated village. The original structure is thought to have been built in the thirteenth century. It was replaced by the present structure, built in 1892-94 to the design of the architect George Halliday in Gothic Revival style. It features intricate and distinctive carving and craftsmanship in stone and other materials. Of the earlier building the stones of the chancel arch and one roof truss in the chancel are the principal items retained in Halliday's design, which was commissioned by Miss Olive Talbot of Penrice (Newman1995, 476; Orrin1979, 50-53). The settlement pattern/distribution of the area appears to be in place by the late eighteenth century, as indicated by the estate plan of 1782, and little change is noted on the tithe, or indeed the survey of the 1st edition 25-inch OS map of 1879, apart from some minor accretions to the existing settlements. The major change to the area between the map of 1782 and the tithe map of 1844 is the amalgamation of the agricultural enclosures in the area south and west of Nicholaston Hall. Kissock's study of the area notes a general pattern of large enclosures to the west and fragmented holdings to the east at the time of the tithe survey and concurs that the pattern was the result of a period of agricultural improvement of c.1800, probably associated with the Talbot family taking the land under its direct control, the estate plan showing that the pattern of landholding and boundaries depicted on the tithe was at least in part of recent of date. During the late eighteenth century a series of small fields, mostly long and narrow in shape were to be found around the hamlets of Nicholaston and Perriswood, indeed a survey of 1632 indicates that the landscape of landshares had survived intact into the mid-17th century. In his reconstruction of the fourteenth century landscape of Nicholaston, Kissock has hypothesized openfield closes existing in the area extending east of the church with its Glebe land towards the main settlement cluster (Kissock 1986, 41-49). The manorial centre of Nicholaston Hall (00289w; 19463) with its associated gardens (265708) and set within a more regular pattern of small to medium sized enclosures, is thought to be a late or post-medieval construct established on what would have been former unenclosed grazing according to Kissock's model reconstruction of fourteenth century Nicholaston (Kissock 1986, 41-49). The Hall is noted in a record of Hugh ap Meredith of probable sixteenth century date, though Rice Merrick writing during the late sixteenth century records it had passed to Sir Edward Mansel by this date (James 1983, 114-115, 118). The first edition map depicts the post-medieval Nicholaston Hall (00289w; 19463), with its gardens (265708), located to the west of the area, well away from the settlement concentration, but notably close to the large amalgamated fields of the area. The landscape of smaller enclosures and fossilized quillets survives at this date towards the east near the boundary with Penmaen Parish, and north of the area adjacent to the common of Cefn Bryn. Two limekilns are depicted on the first edition 25-inch OS map of 1879 above Nicholaston Cliffs: one to the west (02494w), the other with an adjacent quarry (02218w) to the east. Later editions suggest the quarry, at least, continued in use until the early part of the twentieth century.